Emma Stone, Karen Elson, and Lucille Ball were all born blonde. Redheads really have more fun. “Let the color set for 48 hours before washing your hair, please. You can use blow dryers and curling irons if you want, though, as long as you protect it with heat styling products.” Recommended: Shu Uemura Essence Absolue. “Think of it this way. For special clothes, you’ll use something more gentle than laundry detergent, and you’ll use color safe bleach. Your hair is the same way. Use shampoo and conditioner formulated for color-treated hair to make your look last longer. Recommended: Gemstone Color Shampoo and Conditioner. 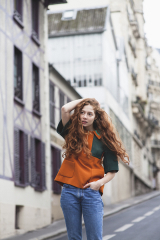 Jenna Thiam shot by Jérémy Barniaud in Paris, France. Stylist: Francesca Parise. Hair: Chris Vourlis. Makeup: Mayumi Oda.